Are we ignoring potential health problems due to wireless technology? Ever wondered if radiation coming from wireless devices like mobile phones and telecommunication towers is really harmful to us?A small group of Malaysians claim to have found evidence that overexposure to these devices, which all emit electromagnetic radiation (EMR) waves, could lead to various health problems.For several years now, members of this group have been campaigning against telco towers being too near our neighbourhoods and schools, most notably the 1BestariNet project to provide internet for students in classes. Astro AWANI spoke to experts from this group who have recently broken significant ground in their research into the subject. We also interviewed activists as well as those who claim to be able to immediately feel the effects of EMR waves. Lastly, we asked the government (Education Ministry) how it plans to tackle this issue. Having personally seen several patients with some inexplicable symptoms, Dr Adlina Suleiman, an associate professor from MARA University of Technology (UiTM) and Dr Thor Teong Gee, a general practitioner, has been conducting several independent studies on the subject of EMR from telco towers. So far, their latest findings seem quite scary: Those who have been living near to telco towers indicated a higher chance of getting headaches, giddiness, insomnia, loss of memory, diarrhea, mental slowness, reduced reaction time and mood swings. They also found that more cases of cancer happens to those who live less than a few hundred metres away from these towers, concluding that one would have a higher risk of developing cancer after being exposed to EMR for years. Dr Adlina, who noted the 2011 World Health Organization (WHO) report in which radiofrequency electromagnetic fields were classified as “possibly carcinogenic to humans”, said they are heading to Johor next to collect more data after conducting three studies – namely in Subang, Perak, and Penang. Dr Adlina believes there is a 1.1% increased risk of DNA damage those who live nearer to towers, compared to those not in high power density areas. “Blood samples we took (in Penang) found that there is a 1.1% increased risk of DNA damage those who live nearer to towers, compared to those not in high power density areas,” said Dr Adlina. While she admitted that the scientific community worldwide has not conclusively found causal relationship between EMR and illnesses, she argued that it took scientists some 40 years to find evidence that smoking tobacco can cause cancer. “If you want to wait for clear evidence on the negative effects of EMR that only you are able prove that EMR will definitely cause something bad then we will do something about telco towers, then it may already be too late. Some people already have (health) problems,” said the doctor, adding that definitive prove can be obtained as soon as animal tests were done. Also on a mission to reach out to more Malaysians and get the authorities to act on this controversial issue is the Penang EMF (Electromagnetic Fields) Protection Alliance. 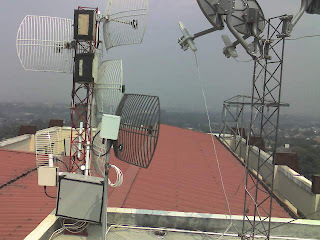 The group, part of the national level Anti EMF Radiation Alliance as well as the International EMF Alliance, has been voicing out on the dangers of telco towers since 2008. “We are not at all saying we have to avoid all these communication technologies, but we have to consider the safety and health of our beloved families first,” its secretary, Ong Bee Lay, said. Teacher activist Mohd Nor Izzat Mohd Johari of Suara Guru Masyarakat Malaysia (SGMM) has also asked the government to review the 1BestariNet project, especially in terms of complaints on speed issues. Mohd Nor Izzat questioned if it was ethical for the towers, built by YTL Communications, to also be providing Wi-Fi services for residents outside of school compounds. The government is aware that it has come under scrutiny, especially after announcing its plan in 2012 to install 10,000 telco towers in schools nationwide under the 1BestariNet project. Touted to enable “every child the opportunity to access quality education at any time, from anywhere and according to his or her own pace”, the project is supposed to provide schools with broadband internet connectivity and Virtual Learning Environment. Education Ministry’s Educational Technology Division director, Rosnani Mohamed Ali, said the various agencies are constantly monitoring 1BestariNet and its safety is at the forefront. “From the studies we’ve done, we want to assure the teachers, students and parents that these towers are not dangerous to health… we follow all specifications. “It is actually no more dangerous for a child to be in school with a 1BestariNet tower than to be in a school that has TV and radio coverage,” Rosnani told Astro AWANI, stressing that the 1BestariNet towers emit lower waves than other telco towers around Malaysia. What have the other agencies said so far? A 1996 study by an ad-hoc committee consisting of government agencies such as the Health Ministry and several universities had concluded that there were no concrete proof to show that exposure to EMR would have any health effects or defects. Malaysian Nuclear Agency radiation safety and health division manager, Dr Wan Saffiey Wan Abdullah was reported to have said there was no proof that emission from telco towers, which he said were lower than mobile phones, could cause illness to people nearby. “We did not carry out studies on the effect of electromagnetic radiation on people but we adopted data used in the United States, Europe and China,” he had said during a dialogue with residents in Muar. However, Dr Wan Saffiey admitted that there were people who were “electro-sensitive” to radiation from mobile phones, towers and Wi-Fi who could become ill. But the number was very small. The Malaysian Communications and Multimedia Commission (MCMC) had also reportedly assured people that telco towers in Malaysia were well within international safety levels. Although there has yet to be any conclusive, 100% proof linking EMR to health effects, the work from the Malaysian group who are using their own funds to study the subject seems to be getting somewhere. The 1BestariNet project is of special concern as it involves the health of young, studying children, and the government is now expected to keep to its word that it would do further studies on its possible health risks. There is nothing that the government, private entities and Malaysians would lose for finding out more through scientific studies. It would certainly only help us ensure that we could protect our next generation, one way or another.